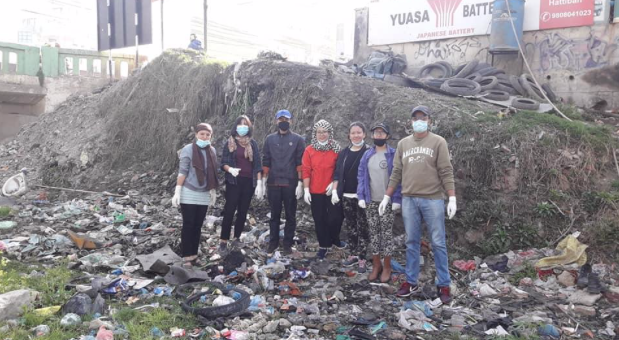 On March 22nd, 2019 on the auspicious day of World Water Day, the students of Kathmandu University SDG Students Hub organized a cleaning program following the recent trend i.e. trash tag, as a first event where all the hub member equally participated in the activity. The cleaning campaign was done at the river side near the university. The main aim of the event was to encourage people to clean the surroundings and to demonstrate the power of unity setting the example that together we can do anything for the environment, against the odds. Change is possible if we start from self. The event, with a kind support of all the hub members, was very fruitful. All the members equally contributed their time and effort during the event. As we selected the river bank which therefore was extremely polluted, all the hub members were very confused to start with but then we planned to segregate the recyclables products/trashes with non-recyclable. In this way, we almost collected 12 sacks of waste from the site which precisely wasn’t of all what we expected earlier. Being a very first event, we as Hub members, were on first-hand engagement that demonstrated the significance of youth in making change a reality. Through this event, we not only fulfilled our responsibility as youth but also spread awareness to the public. Realizing that nature are our natural assets and preserving such a gem from the odds are our major defending obligation. From one to ten and from ten to twenty. We are growing. By this end, we have now proposed a plan in organizing many other events in future days. With this event being a very first activity on behalf of Kathmandu University SDG Students Hub, it has motivated us to organize further initiatives and collaborate with other several organizations for a good cause and essentially for a global agenda which is often called the Sustainable Development Goals. Varsha Pradhan 24-year-old female graduated from Tribhuvan University where she did her bachelors in the field of social work. Currently she is doing her master’s degree in Human & Natural Resources studies at Kathmandu University School of Arts. Being a social work student, she has actively participated in a volunteer activity and learned, explored new things which helped her a lot to come out from her comfort zone. Talking about her previous experiences she worked as a volunteer at VSO Nepal under ICS project where she was placed in a community for 3 months with a UK volunteers where she conducted various livelihood programs. This program helped her a lot to explore herself and learned the cross culture from my UK counterparts as well as from the people in community. Similarly, she also worked as a School Liaison Officer at NCEP-Nepali Children’s Education Project which was a Canadian project for the underprivileged children, where she gave a tutor class to the scholar in the government school along with supervising the field volunteers. She had an experience Working as a bridge between Management, Field Volunteer and Scholar. She also worked as a social work trainee at UCEP Nepal i.e. Underprivileged Children Education Program where she learned about the organizational structure how it runs and so on. Assessment, Designing and Conducting life skill sessions to improve employability of trainees of Sano Thimi Technical School and Conducted life skill session for social integration of juveniles in juveniles’ homes. As an active citizen, She recently appointed as an education officer in the KU-SDG hub, where she look forward to contribute her time, effort and ideas to make people aware about various social issue.